Being a mercenary on the edge of civilization is anything but easy. For those stupid or brave enough to leave the relative safety of Gloomhaven's walls, adventure, wealth, and fame await in wild and shadowy forests, snowy mountain caves, and long-forgotten crypts. Just don't expect anyone to pay for your services up-front, because no one expects you to come back alive. 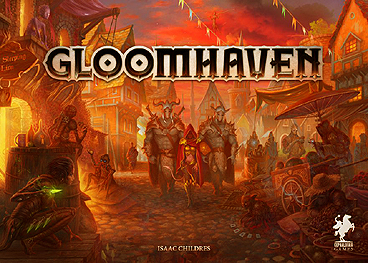 Gloomhaven is a cooperative game of tactical combat in a unique, evolving fantasy world. Each player will assume the role of a hardened mercenary with their own personal motives. Together, players will fight through a campaign of scenarios that reacts and changes based on the players' actions creating a unique game state full of discovered treasure, retired adventurers and permanent choices. Each scenario offers players deep tactical decisions, where ability cards have multiple uses, and using the right ability at the right time can mean the difference between success and failure. Gloomhaven offers stream-lined tactical combat without dice against fully automated enemies, each with their own unique behaviour patterns. In this box, players will find a fully realized fantasy campaign experience of unparalleled scope and depth.